At the time of the interview, James was appearing as Amos Hart in the musical Chicago at the Cambridge Theatre London. Chicago is the winner of the 1998 Olivier Award for Outstanding Musical Production and is the longest ever running Broadway musical revival in London’s West End. James was born on 17th December 1966 in Guildford, Surrey. His mother loved the theatre and perhaps seeing James’ potential enrolled him in drama classes at the age of six. He went to Felsted School in Essex and while at the school gained acceptance to the National Youth Theatre at the age of 15. The next step in James’ acting career was to take him back to his roots in Guildford, where he trained at The Guildford School of Acting (GSA), renowned for providing many actors for the West End stage. James is married to the TV presenter Joanna Sinnott http://www.joannasinnott.com/ who is currently producing & presenting the series ‘Wild Camping’ for the Travel Channel. They live in Wimbledon with their five year old son, Jago. James is appearing in Chicago until Aug 27th. I recently asked James some questions about himself and his career. At what age did you realise that you wanted to be an actor and did anyone in particular inspire you to want to be on the stage? Really young. Aged 6 I went to drama classes in Guildford. I later went to Felsted, a boarding school in Essex. Drama was a really big deal there and the late Chris Clement was an inspirational English teacher and director. My mother has always loved the theatre and took us from a very young age; she’s always been incredibly supportive. Where did you train to be an actor? National Youth Theatre, Guildford School of Acting… and on the job every day! A Slice of Saturday Night at the Arts Theatre in 1990. It was back in the day when you had to earn an Equity card to work. I was ASM Understudy. My duties included sweeping the stage, making tea and ‘understudying’ all four men in the show! Great training. God I sound old! Do you have a preference for performing on the stage, television or film? To be able to do all three is for me, what it’s all about. I love ‘mixing it up’ moving between tv, straight plays, musicals and films. The variety is exciting and of course the more you are able to do… the more work is available to you! True, you can’t beat a live audience but the ‘family’ atmosphere and camaraderie on a long running tv series is fantastic. The focus required on a film set is huge, especially with all the waiting around involved… But then I get paid for waiting around… I do the acting for free! I’ve always been really inspired by Robert Lindsay. He’s a terrific actor. 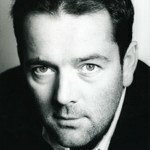 He won a Best Actor in a Musical award for Me and My Girl in the West End and on Broadway, was stunning in Cyrano de Bergerac at the Haymarket Theatre in 1992, compelling in GBH written by Alan Bleasdale for TV and just perfect in sitcoms like Citizen Smith and My Family. He moves between styles effortlessly. Yup, that’s what it’s all about! What is it like performing as Amos Hart in Chicago? Amos is one of the only honest/pure characters in the show. I think the audience recognizes this and the response is just terrific, incredibly rewarding. It can be quite hard to join a show that’s up and running, but apart from the obvious restraints of singing the right notes and standing in the right place we’re allowed a fair amount of freedom in our interpretation of the characters. I’ve been very much encouraged to make the character my own and have loved building on this night after night. I don’t see Amos as particularly simple or stupid. He’s a mechanic, a working man totally at sea and out of his depth in this glamorous world of Showbiz, Showgirls, Jazz, Liquor & Lawyers! I haven’t done a musical for quite a while and had forgotten how much I enjoy singing, it’s very liberating! To get to sing Mr Cellophane with a big band every night is a total joy. What do you usually do on your nights off from Chicago? I only get one night off a week. Sunday. I get to put my five year old son to bed and have dinner with my wife! Apart from Amos Hart what is a favourite role that you have performed? I loved playing the fantastically camp Brian Simms in ‘Is Harry On The Boat’ for 2 years on Sky 1. I got to work with my great friend Steve North who played Cosmic Bob… We shot the 30+ episodes in Almunecar Southern Spain which was doubling for Ibiza… and laughed every day. If you could choose a character to perform in any play or musical, who would it be? The parts haven’t been written yet! I’d like to work on a totally new musical and play. Creating the characters from scratch. That would be a fantastic opportunity. My Sister, Mary Doherty who is also an Actor. She’s currently appearing at The Globe in All’s Well That Ends Well & Anne Boleyn. We’ve never worked together… yet! My Father… He’s a Gentleman. I live in Wimbledon. We love the common and walk our dog there almost every day. Guys & Dolls (never done it, would love to) Loved les Mis and played Grantaire years ago, would love to go back and have a go as Thenadier. Massive film fan too numerous to mention although I love small Indie comedies such as Sideways, Juno and of course Whitnail & I ! You have many skills in your portfolio, but ‘a Forklift Truck Licence’ – how did that come about? Ha ha – I used to drive the truck during holidays from drama school…. It all ended when I crashed twice in 2 days. Once into a 10ft pallet of coffee and the next day into a 10ft pallet of shampoo… the bottles burst turning the loading bay into a foaming skidpan! Thanks for taking time out from your busy schedule James to give an insight into yourself and your career.